City Book Centre is a secondhand book store in Andheri West. It stocks all of our favourite authors, old and new and has been around for more than a decade now. 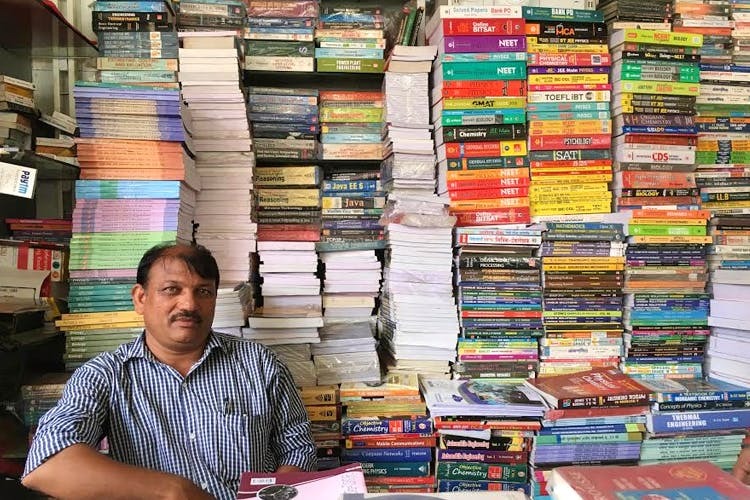 This almost pavement like book store is run by Pramod Bodade, a legend amongst the college going kids who flock here often to pick up their academic books. However, the bookstore is not limited to just college books. They have plenty of novels, fiction and non-fiction, along with a host of magazines ranging from your Nat Geo Traveller to Conde Naste. Pramod tells us he first had a shop on the pavement in Churchgate. When the street shut shop, he moved to Andheri and has been here since 2005. This book store also rents out books. That’s right. When you buy the book, and return it within a month’s time, you get back 70 per cent of the cash back. For example, the book cost you INR 100. If you return it within a month, you get back INR 70. A great deal, isn’t it? Coming back to the books. The store is really diverse and very well-stocked. From your Indian authors to international authors, you can find it all here. The popular genre takes space on shelves, like your Dan Browns, Sindney Sheldons, but they also have rare books here. Cook books, decor magazines and history hard covers, find them all. Prices vary according to the books, but a classic novel like To Kill A Mockingbird starts at INR 80. The bookstore is open on all days from 10.30am to 9pm. If you’re a college student, this is where you save money on your expensive college books. If you’re a book lover, but also don’t have enough space to keep them all, try out their renting system.